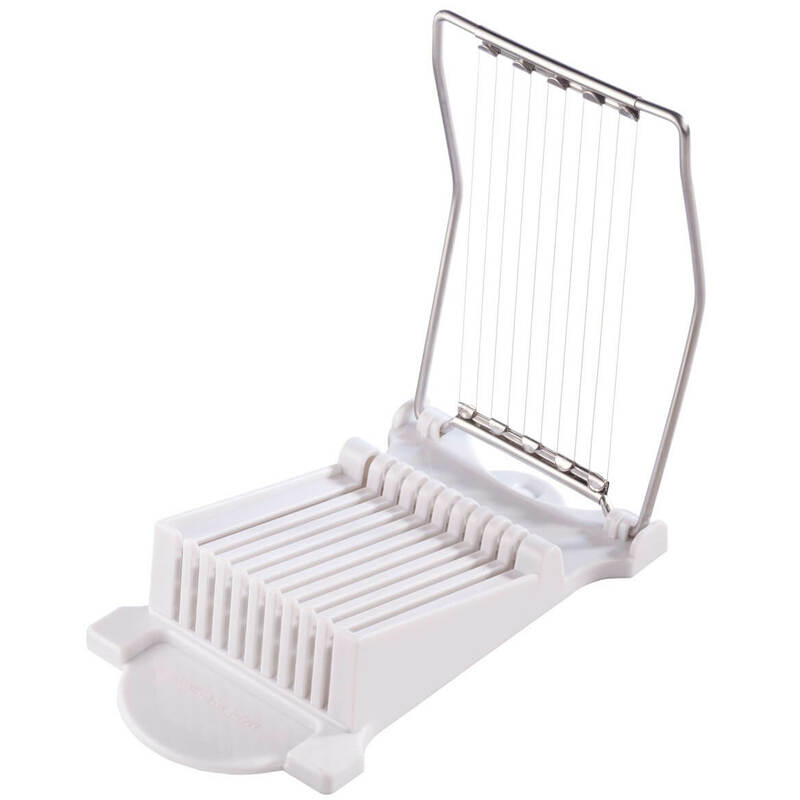 Create even slices of cheese, eggs, veggies and more with a simple push of this multi-food slicer. 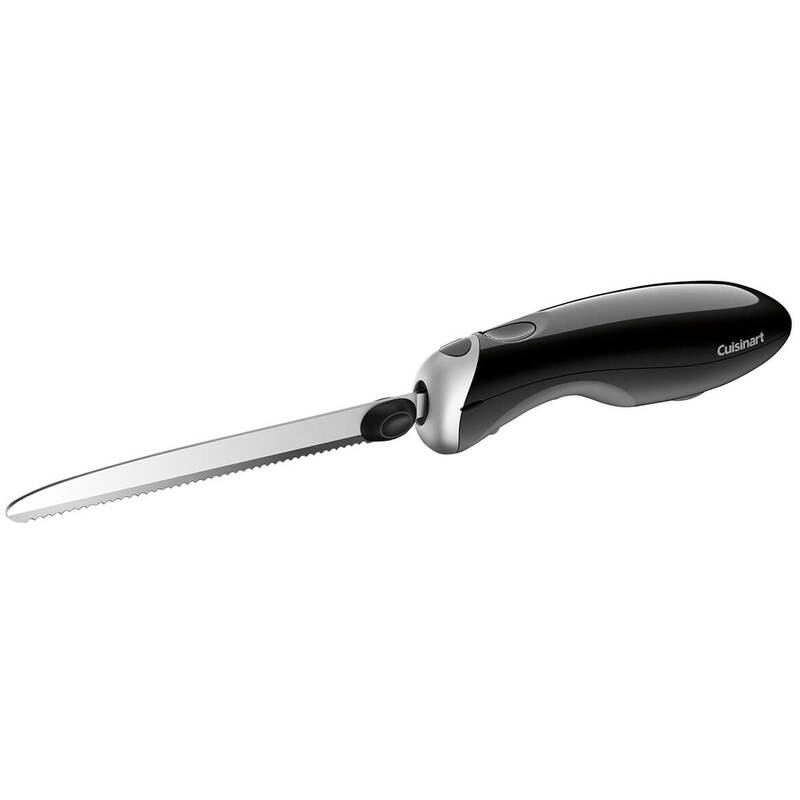 Handy slicer’s stainless steel slicing wires help you quickly prepare mouthwatering salads, sandwiches and platters. Dishwasher safe. 8 3/4″ long x 5″ wide x 2″ high. This multi-use kitchen scissors with magnetic holder not only cuts most any material, snips herbs and trims meats—it also detaches into 2 kitchen knives (1 serrated), while handles function as can and bottle openers. 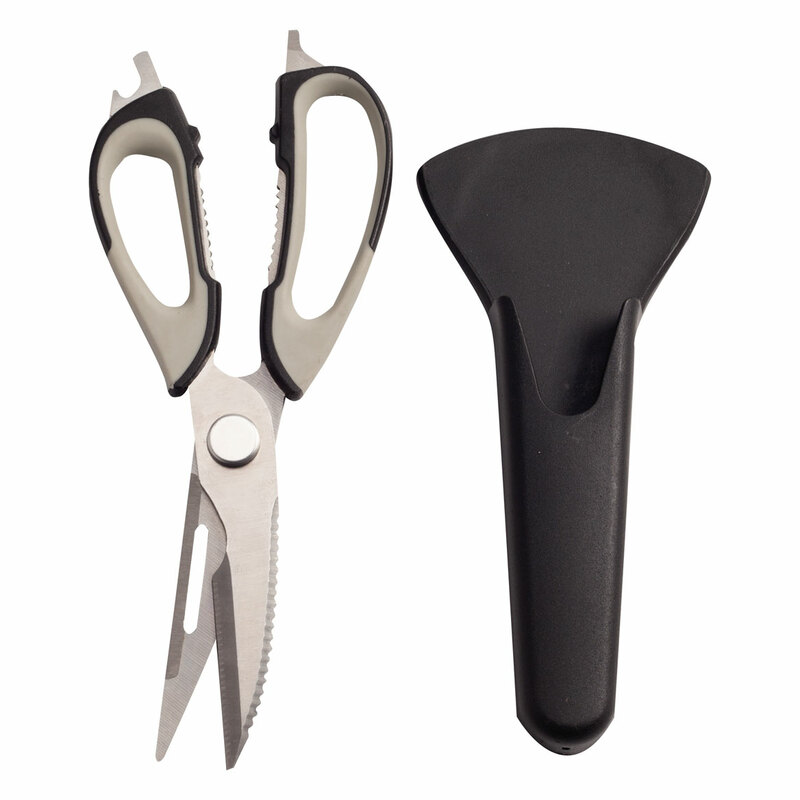 A must for any kitchen, the versatile kitchen shears feature stainless steel blades and easy-grip plastic handles. For added convenience, they include a magnetized sheath to hold them securely on the fridge. Scissors: 9″ long. Holder: 7 1/2″ long. 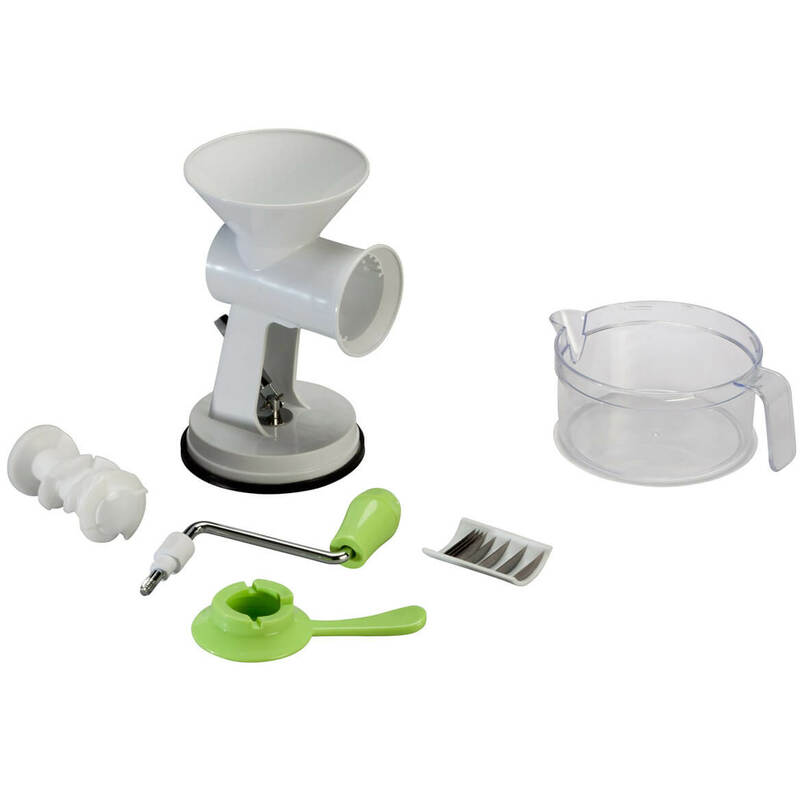 Simply turn this Norpro® easy-crank nut chopper to grind nuts, candy, cookies and other toppings—quickly and easily! 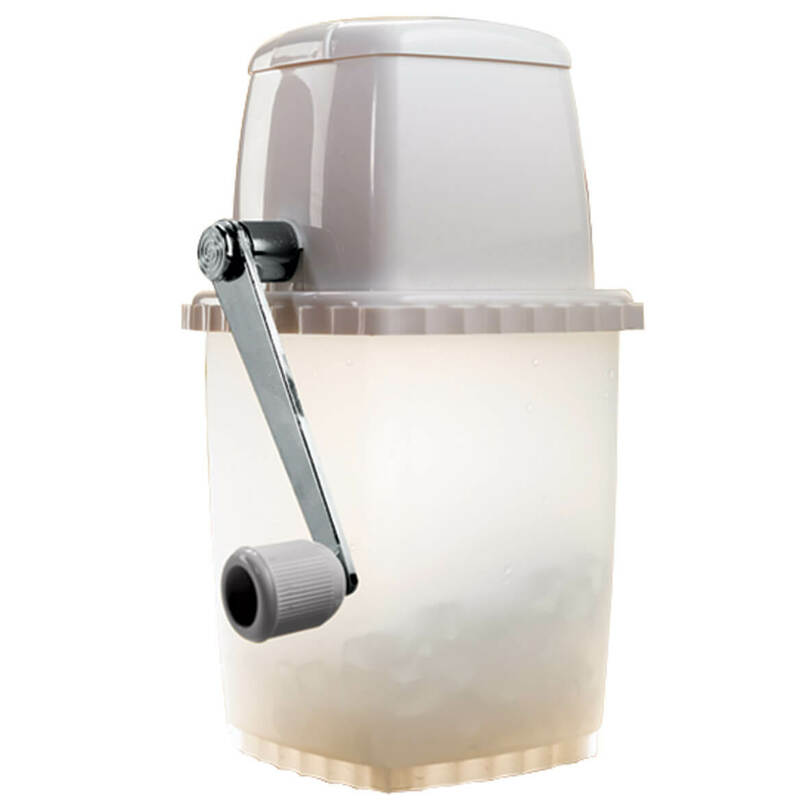 Convenient and efficient for baking or topping salads, cereals and desserts, the portable nut crusher’s stainless steel blades rotate while you crank, evenly chopping without batteries or electric power. Just fill plastic lid, close and crank; chopped goodies fall right into bottom glass container, ready to remove, pour on and enjoy! 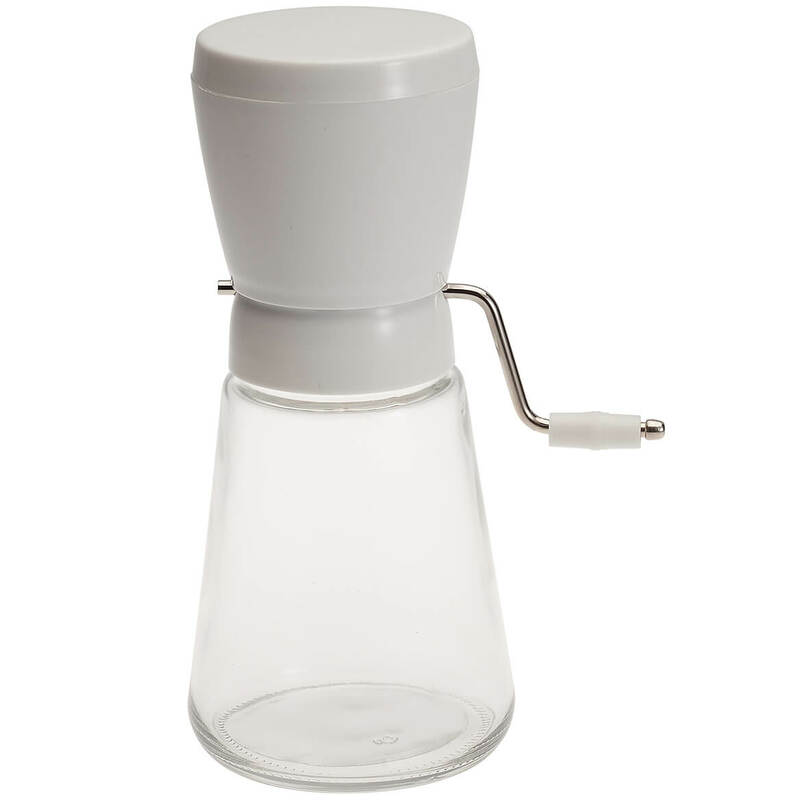 Measures up to 1 1/4 cup/10 oz. Hand wash. 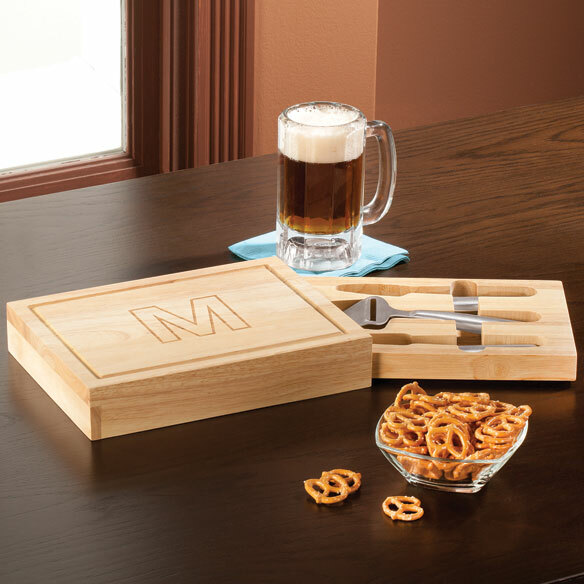 Entertaining is so much easier with the right accessories, like this personalized rectangular cheese board with tools. Made from durable wood, the personalized cheese board is the perfect size for presenting your favorite wedge or slices. No more hunting through your kitchen drawers for serving tools, because the board’s slide-out tray keeps a spatula, spreader and fork right inside. Personalized with a single initial, it makes a great addition to your kitchen or a perfect gift idea. 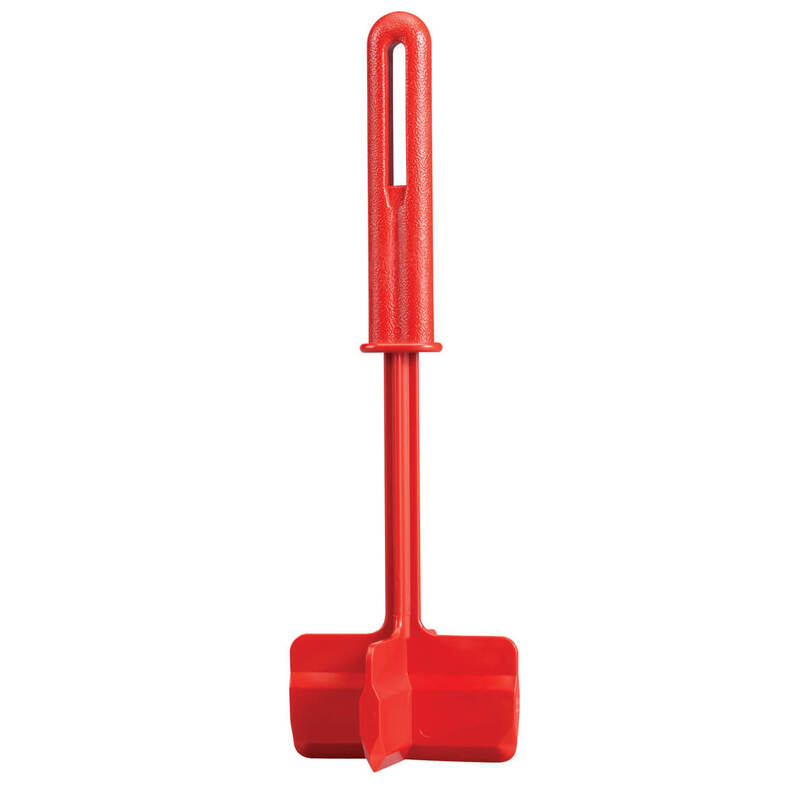 Measures 7 1/2″ wide by 10 1/2″ long by 1 3/4″ high. 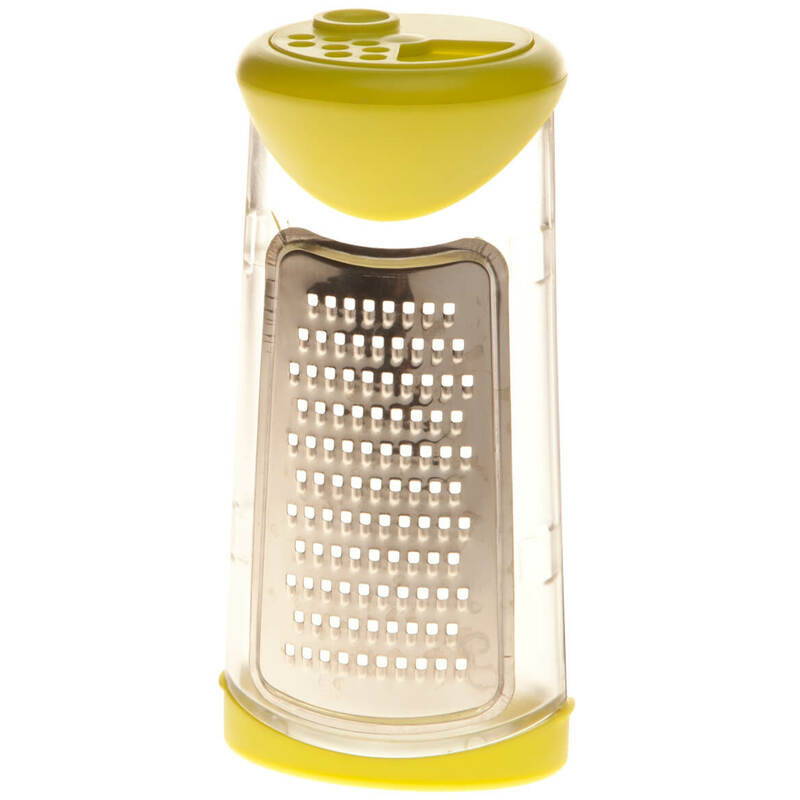 Core and slice fresh pineapples quickly and easily with this serrated corkscrew-like pineapple slicer and corer tool. Just snap on the handle, insert into pineapple and twist. The results of your simple effort with our pineapple slicer: one perfect spiral of sweet pineapple, complete with healthy juices! Plastic. 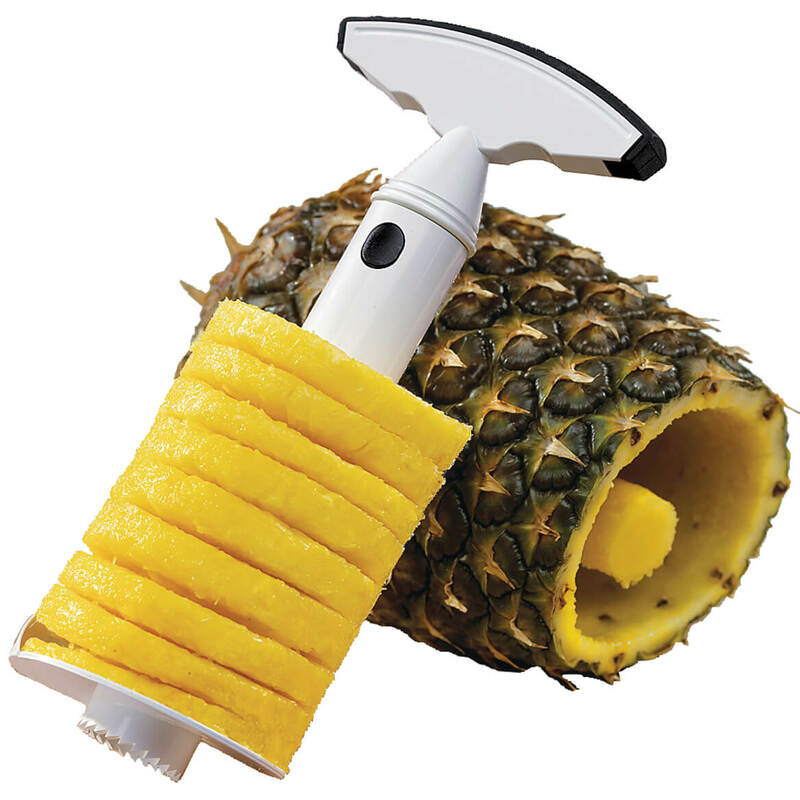 This pineapple corer is dishwasher safe.